Free shipping. Buy direct from HP. 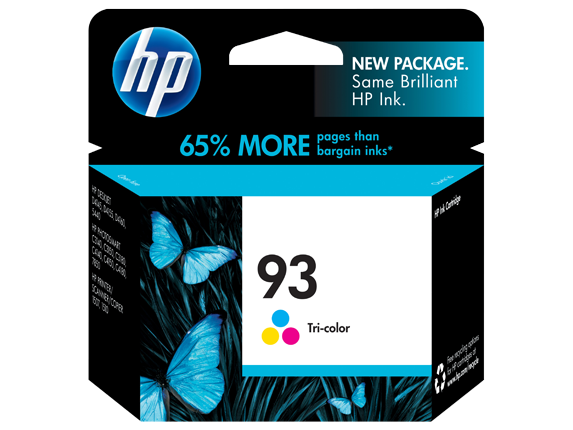 See customer reviews and comparisons for the HP 93 Tri-color Original Ink Cartridge. Upgrades and savings on select products. Rich, lifelike color quality with Original HP inks for vibrant photos and graphics that resist fading for generations. Part of HP's 6-ink printing systems for a greatly enhanced color gamut and warmer skin tones. Rich, lifelike color for vibrant photos that capture mood and emotionMake memories last with photos that resist fading for generations. Superior ingredients in Original HP inks provide exceptional fade resistance. Original HP inks are tested to provide the best combination of image quality and fade resistance.Smart Printing technology ensures color consistency between cartridge changes and in every photo. Ensures optimal, genuine HP performance in your photo printing. Original HP inks are pure, and free of harmful contaminants, ensuring optimal reliability and quality.Advanced ink cartridge technology ensures excellent results you can rely onEnsures optimal, genuine HP performance in your photo printing. Rich, lifelike color for vibrant photos that capture mood and emotionMake memories last with photos that resist fading for generations.Superior ingredients in Original HP inks provide exceptional fade resistance. Original HP inks are tested to provide the best combination of image quality and fade resistance.Smart Printing technology ensures color consistency between cartridge changes and in every photo.Ensures optimal, genuine HP performance in your photo printing. Designed for easy and intuitive installation in your HP printer.Alerts let you know when ink levels are low. HP SureSupply makes it easy to shop for replacements.Easy to recycle through HP Planet Partners program.